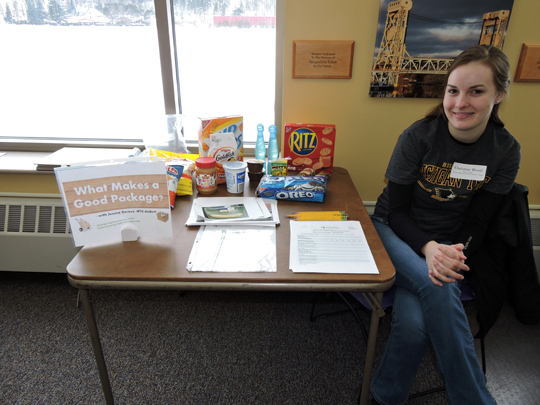 Graham Jaehnig/Daily Mining Gazette MTU student Christine Wood offered a demonstration called “What Makes a Good Package” at Saturday’s cardboard recycling celebration at the Portage Lake District Library in Houghton. HOUGHTON — Local residents celebrated a year of recycling Saturday at the Portage Lake District Library in Houghton. The two-hour event was well-attended, and visitors found presentations and activities to meet a wide range of recycling interests for all age levels. Children learned about recycled art, how to build a fort from cardboard and several other activities, including a toy and book swap. There were presentations on green household cleaners, as well as recycling reports from Houghton and Keweenaw counties and Chassell Township. At 11 a.m., Michael Schira, of the MSU extension office in Hancock, gave a one-hour presentation on backyard composting, in which he discussed the benefits of composting. During his presentation, he addressed his talk to people who may have tried composting in the past, and were not either successful, or were not as successful as they had hoped to be. Along with his one-hour talk were included handouts and informational sheets. Evan McDonald, co-chairman of the Copper Country Recycling Initiative, was on hand and said he was happy with the turnout. He said he was encouraged by the interest of the members of the community in recycling and the steps they can take in reducing the waste stream. The event was sponsored by the Copper Country Recycling Initiative, the Portage Lake District Library, the Western U.P. Center for Science, Mathematics and Environmental Education, the Lake Superior Stewardship Initiative and the Keweenaw Coop.